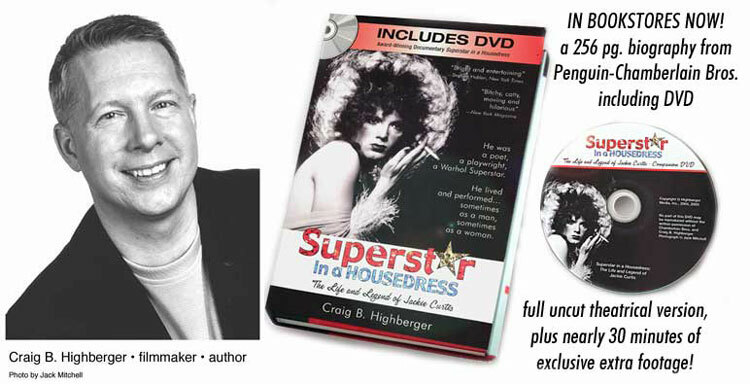 Craig B. Highberger joined Penguin's roster of authors in spring 2005 with the publication of his full length biography of Warhol superstar Jackie Curtis, "Superstar in a Housedress". Included with the book is the DVD of Highberger's award-winning documentary of the same name. For the book, Highberger interviewed more than forty friends and colleagues of Curtis including celebrity photographer Jack Mitchell, director Paul Morrissey, surviving superstar Holly Woodlawn and Tony Award winners Lily Tomlin and Harvey Fierstein. Heavily researched, the book includes interviews with Jackie Curtis, letters and diary excerpts, photographs, poetry and excerpts from Curtis' plays "Glamour, Glory and Gold", "Heaven Grand in Amber Orbit", and "Vain Victory". The hardback was published worldwide by Penguin's Chamberlain Bros. imprint, a multi-faceted division producing hardcover books, paperback originals, gift books, kits, and multimedia projects. Penguin Group (USA) Inc. is the U.S. affiliate of the internationally renowned Penguin Group, the second-largest English-language trade book publisher in the world.